Below is step wise method s statement for Installation Of Ceramic, Porcelain & Agglomerate Tiling Works. Rubber mallet and other Hand tools as required. Only approved materials will be used in execution of tiling works. Handling, Delivery and Storage of tiles, adhesives and cementatious / grout materials will be in a manner to ensure no discoloration and damages occurs. Tile consignments shall be stacked in batches segregated with respect to type, color, shape, thickness and form. Tiles from different batches will not be mixed in one batch / bundle. MEP clearances will be secured. Provision of floor drains, where applicable, will be ensured as per approved shop drawings. Base work to receive tiles will be examined prior commencing fixing and installation of tile works and discrepancies regarding accuracy and suitability in location that may adversely affect installation and permanency of works, if any found, will be reported to CONSULTANT. Before laying tiles it will be ensured that relevant setting out and shop drawings are approved by CONSULTANT. It will be ensured that there are no unintended color/shade variations within the tiles for use in each area and tiles delivered at site are as per approved dimensions and relevant approved Material Approval Requests. Variegated tiles, where found unavoidable, will be thorougly mixed to ensure symmetrical and uniform appearance of completed tile works. Mock-ups for each type on Consultant identified location will be installed for Consultant’s approval, prior to start construction of actual works accordingly. Actual works will be carried out in accordance with Consultant approved mock-up. Approved mock up may remain as part of the completed works. Cast in place concrete substrate shall be sufficiently smooth and level such that when thin set mortar/adhesive to accept tiles is applied. Grind off high spots and fill in low spots as necessary to ensure no void occurs. All toilets and pantries where to receive waterproofing, apply waterproofing prior to installation of tiles following the detail as shown on the relevant approved drawings. Where the walls are to be finished with tiles, apply a leveling coat of cement mortar as approved to a minimum thickness of 12mm, sufficient to cover the unevenness of the substrate and to make walls true vertical. Mortar will be trowel smooth to leave a surface suitable for use of adhesive as approved. Where shown on the drawings, apply the waterproofing using the materials as approved in accordance with manufacturer’s recommendations prior to installation of tiles. Mix bedding / adhesive materials thoroughly as approved to a uniform consistencey in a suitable forced action as per manufacturer’s recommendations. For installation of ceramic/porcelain/agglomerate tiles as required by approved shop drawings/finishing schedule. Only the approved tile adhesive /mortars will be applied to substrate and backside of the tiles as per the manufacturer’s recommendations. Tiles will be laid in prepared area to give true and regular appearance to tiles and joints maintaining the desired level as shown on the approved drawings. Tiles will be fixed in accordance with approved setting out drawings. Level marks will be provided and set out up to finish level as per surveyor’s marking based on the approved drawings. Tiles will be fixed in place and pressed firmly with twisting / sliding action to give finished bed thickness within the tolerance limits as defined in specifications and drawings. Installation will be in manner to ensure that no voids under the tiles occur. It will be ensured that Joints are true to line, continuous and without steps. The joint width will be 2mm or shall be determined according to manufacturer’s recommendations and the material used for grouting. Ensure joints in skirting and Joints between walls and floors are continuous and match in alignment. The supply and laying, fixing or installation of the various types of floor and skirting finishes will be as shown on the approved shop drawings or finishing schedules. The materials used for each type of floor and skirting finishes shall be approved by the Consultant. Control joints will be provided in large areas in each direction and at perimeter walls or where required as per detail shown in relevant approved shop drawings. The tiles will be fixed closely to electrical outlets, piping, fixtures, and other penetrations so plates, collars, or covers overlap tile. The tile work will be extended into recesses and under or behind equipment and fixtures to form a complete covering without interruptions, unless otherwise indicated and will be terminated neatly at obstructions, edges, and corners without disrupting pattern or joint alignments. Pre-mould corner pieces shall be provided for all right angle corners as per approved shop drawing. Surfaces will be sloped uniformly where indicated/required by drawings. Tile floors shall be finished flush with gratings, strainers and drains, where applicable and as shown on the drawings. 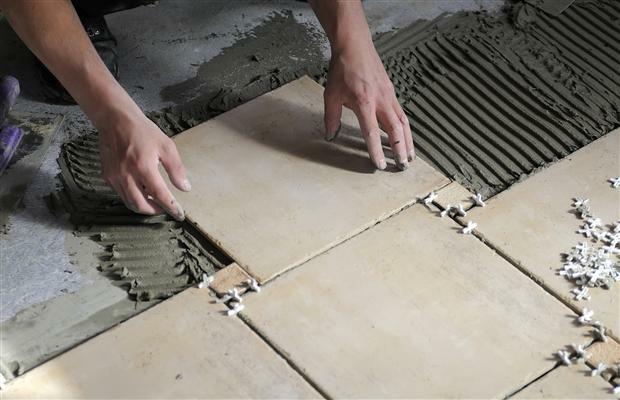 Application of tile adhesives and grouts, as approved, will be carried out in accordance with manufacturer’s recommendations and relevant temperature and humidity conditions specified in manufacturer’s product data sheet. Allow bedding/adhesive materials to harden sufficiently before grouting. Ensure that the joint width and depth is maintained to 2mm & 6mm (or the depth of the tile if less) respectively or in accordance with grout/tile manufacturer’s recommendations and free from dust and debris. Grouting and filling of joints will be done in accordance with grout manufacturer’s recommendations. Grout will be forced to fill joints completely to entire depth, tooled to an approved profile, clean off by leaving surfaces free from blemishes. Control Joints / Expansion Joints will be provided as per approved shop drawings and will be sealed with approved special sealants. Floor will be closed for all kind of traffic including foot traffic for 24 hours (or as per manufacturer’s recommendations) after installation for sufficient hardening. Installation of all types of tile designated for wall installations to comply with requirements in the schedule. The Joint Width for tiles on walls will be 3mm or according to approved shop drawing. Installed works will be kept cleaned as work progresses. After grouting and pointing, tiles will be cleaned with stiff fiber brushes and water. The use of wire brushes or acids shall not be permitted. Mortars/excessive grouts and alkali washed-offs if any, will be removed from surfaces. At completion, flush down with water to make surface good and cleaned. All debris, equipment and excess material resulting from the work will be removed from the site upon completion of tiling works in the area. Two coats of sealer finish will be applied to flooring and stairs, if applicable, following the sealer finish manufacturer’s printed instructions as approved. The tiles shall be protected and maintained after completion, in a manner acceptable to the CONSULTANT that ensures tiles are without damage. If recommended by the manufacturer a heavy protective covering shall be provided during construction period to prevent staining and damage. All types of foot and wheel traffic will be prohibited from tiled floors for at least 7 days after grouting. The installation of agglomerate tiles (as per approved MAR) at the locations as shown on the approved shop drawings, shall be done using only the approved materials and in accordance with manufacturer’s recommendations. The manufacturer’s instruction shall be followed for mixing of adhesive cement as approved. When fittings the agglomerate tiles, the humidity level in the surface is recommended to be less than 2% as per manufacturer’s instructions. The tiles and floor must be clean, dry and dust free. The flatness of the surface should not have any variation over 3mm when measured with a 2m level. Floor will be leveled off when required using the leveling paste as per manufacturer’s recommendations up to an approximate thickness of 10mm. Place the adhesive cement on the reverse side of the tile using 6-8mm grooved trowel as per manufacturer’s instructions. Place the tile one by one, leaving the expansion joints every 40m² or as per detail shown on the approved shop drawings. Joints width will be maintained at least 3mm between tiles and 5mm at perimeter expansion joint or as per approved shop drawings. In the event of fixing the tiles outdoors, the minimum gap between tiles shall be 5mm and the partition joints shall be made every 30m² or as per detail shown on the approved shop drawings. When the tiles used are more than the standard size, the joint width will be increased in proportion to the size of the tiles. After placing, ram the tile to its position using rubber mallet until they are fully adhered to 100% of the adhesive mortar. Clean the mortar / material that oozes out of the joints/gaps using a moist mop before application of the grout. Grouting and filling of joints will be done in accordance with grout manufacturer’s recommendations after adhesive mortars harden sufficiently i.e. 24-48 hours. Any remains of the tile grout will be cleaned immediately after completion of works.